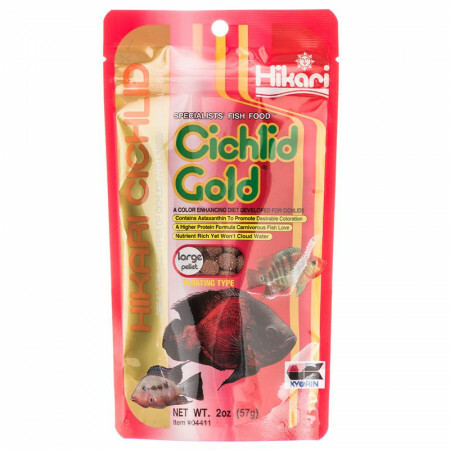 Hikari Cichlid Gold Large Pellet Floating Food contains special color enhancers designed to bring out the natural beauty and proper form of cichlids and other larger tropical fish. We utilize the highest grade of ingredients formulated in exacting quantities to produce a food that will bring the brilliant colors of your fish to life! Great product. 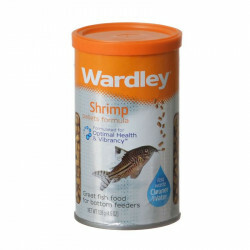 My fish devour these right up! I tried three other cheaper brands, and none of them are as good as Hikari. I have two Oscars, and they absolutely love this. I also noticed slightly brighter colors, and overall they seemed more active. Also, Hikari will not cloud the water, despite being red. Water remains crystal clear, and the fish love this. Only downside is, it is expensive at my store. So I buy it here much cheaper. You spend a few more dollars, but spend less time with filtration and sickness, so well worth it. Fish food came a bit tardy due to postal service having it for two days. My oscar's love this food, but it stinks so bad. Makes the whole room smell when I feed them. The color of the fish is bright and they are healthy, but light a candle when you feed them this food. Love shopping at Pet Mountain, good prices, received all items quickly. Will always buy from them. 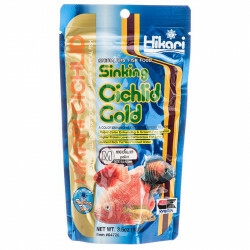 I have been keeping large South and Central American cichlids for about 30 years. Hikari Cichlid Gold is the best food I have found. Pet Mountain prices are unbeatable, and delivery was prompt and accurate. Very good, my fishes love it. I love buying from petmountain, prices are better than in stores. This is great food. My tiger oscars love it! 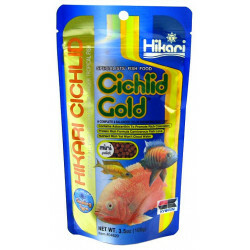 My fish love this stuff!!! I have been buying hikari gold for awhile now and it pays off in the appearance of my fish. I keep mostly Central American cichlids; salvini, texas, midas, convicts. They eat this stuff up! They all have brilliant color and appear very healthy. I will continue to be a hikari supporter and now a pet mountain supporter. I can't find these pellets any cheaper. A big bag for cheap. Would buy again. very good product..affordable at this site too! 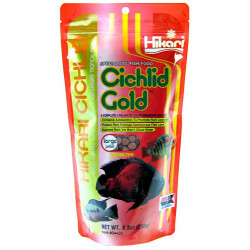 my arowana loves this food and u got the best deal around!!!!!!! My flowerhorns enjoy them and it's very affordable!!! Can't go wrong!!! Your prices are great. Will recommend .